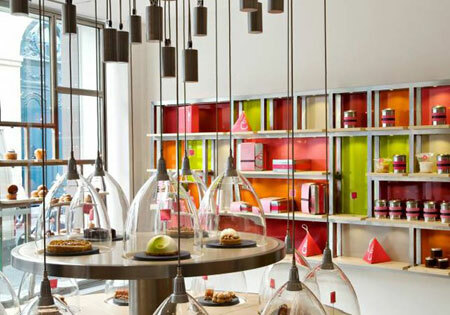 Once you’ve entered Philippe Conticini’s clean boutique La Pâtisserie des Rêves in Rue du Bac close to Conran Shop and Bon Marché you feel like roaming in a starship or the breeding room of a futuresque hospital. You ask yourself, in fact, wether they’ve invented the cake incubator here. Are Conticini’s cakes and sweets really made of eggs? Flour? Sticky liquids? Melted Chocolate? Not here, apparently. Philippe Conticini, one of the hush puppies of Parisian lifestyle magazines, seems to be able to create all his stuff without getting his hands dirty. Or maybe his sumptuous glass cabinet does all the work…? Well, check it out for yourself. People like Conticini always face split audiences: you either love or hate them. I tend to join the latter group and let me tell you why. The boutique’s design reminds me more of a genetic engineering plant or an in-vitro-fertilization-lab than of a nice, reassuring…bakery. And although I’m fond of some decadent sensations every now and then – I don’t like them to become the rule. 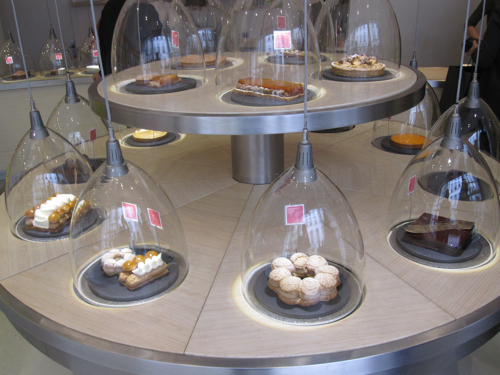 Here, at La Pâtisserie des Rêves, decadence IS the overall principle. It’s as far from how a bakery should look as planet earth is from Spock’s vulcanian homeland. I bought, by the way, a madeleine and a financier, two classic French cakes to see what Conticini’s art is worth. They were both ok, average, nothing more, really. 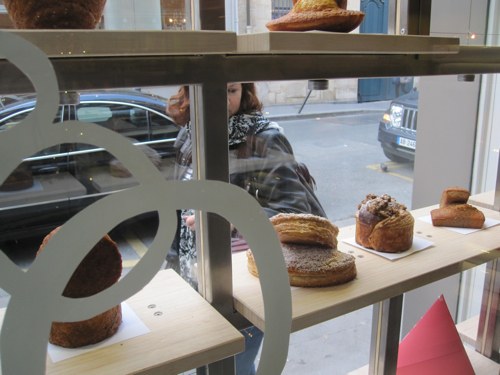 But if you’re interested in concept stores and stuff – just stop by and see how modern Paris can feel. Or head directly to his brand new Salon de Thé, just opened in the posh 16th arrondissement, where you can even take a seat and slowly digest the experience in spotting the fancy clientel.